During the long winter/ cold months my skin tends to get dry. Especially around my nose, it gets flaky. A lot of times it's hard to find products you like. In the past I've tried products that were good, but after a while I wanted something better. I wanted something that was light and not heavy. I don't like products that leave a greasy look or feeling, who would. That's when I was introduced to Valentia. Valentia is a skincare line that uses natural ingredients to repair damaged skin, for healthy looking and smooth feeling! These natural/organic products will repair and the skin. It's proven that, natural ingredients with an organic base are the most effective; when repairing the skin from sun, signs of aging, wrinkles, and dark spots. Their products are free of toxins, alcohol, and paraben. It's also suitable for all skin types. The Valentia True Glow Eye Cream is an illuminating antioxidant rich eye cream, that helps lock in moisture, repairs and tightens the skin for a youthful looking glow around the eye. This eye cream is an intense corrective eye treatment. It reduces wrinkles, nourishes & hydrates the skin, tightens the eye area, brightens dark circles and restores radiance. Astanxanthin: A powerful antioxidant that increases moisture levels, smooth fine lines and wrinkles. This ingredient also restores elasticity to the skin. Resistem: Is a natural plant stem cells repair. It protects the skin from stress, related aging. Vitamin C: This vitamin leaves the skin smooth and visibly brighter for a well- rested/ bright eyed look. Organic Rosehip Oil: An intense hydration to reduce the appearance of fine lines and wrinkles. Amica: An anti- inflammatory agent that is important to the restorative process. I'm pretty cautious when it comes to trying out products. I wasn't sure about how I would feel with this eye cream. When trying it out I was really excited; now I've tried other eye products and don't get me wrong, they were good. But Valentia's True Glow Eye Cream is different. As far as packaging goes, it is easy to pump. It quickly absorbs in my skin and I can apply with ease. There is no sticky feeling and most importantly I see a difference. I have only been using this for a few days, but the dark spots under my eyes are starting to fade. My eyes also feel more awake. In the morning my eyes tend to have a tired look, so this really helped me. If you try this eye cream, use your ring finger or pinky to apply (those fingers are known to be the weakest and applying won't be rough). 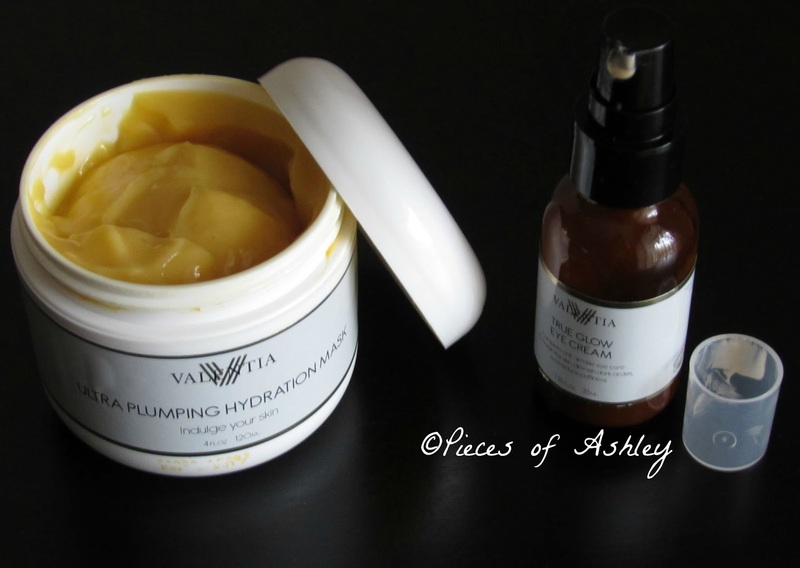 Valentia Ultra Plumping Hydration Mask is a blend of silk protein amino acids and botanical hyaluronic acid, work together to flood the skin with moisture. This provides intense hydration and nourishment. The result is a softer more luminous looking complexion, that feels rejuvenated from the inside out. This hydration mask boosts collagen production and increases skin radiance. It also reduces fine lines and locks in moisture! Silk Protein Amino Acid Blend: These natural miracles increase moisture content and helps production of the collagen & elastin to decrease the appearance of visible lines. Botanical Hyaluronic Acid: When applied topically this plant based substance penetrates deep in the skin. This locks in moisture, supports skin elasticity & structure, and plump the skin from within. Organic Sea Buckthorn Oil: An anti- aging wonder berry that, results in fewer lines, diminished sun spots, more even skin tone, and firmer more supple skin. Organic Rosehip Seed Oil: Essential fatty acids work to lock in moisture, hydrating the skin and keeping it soft and supple. Japanese Green Tea: Contains potent anti- oxidants called catechins that provide anti-aging, anti-inflammatory, and anti-irritant effects to the skin. Aloe Vera: Named by the ancient Egyptians as the "plant of immortality" this nutrient rich botanical moisturizes the skin and fights aging by improving skin's natural firmness. I really enjoy face masks and how refreshing they can be! 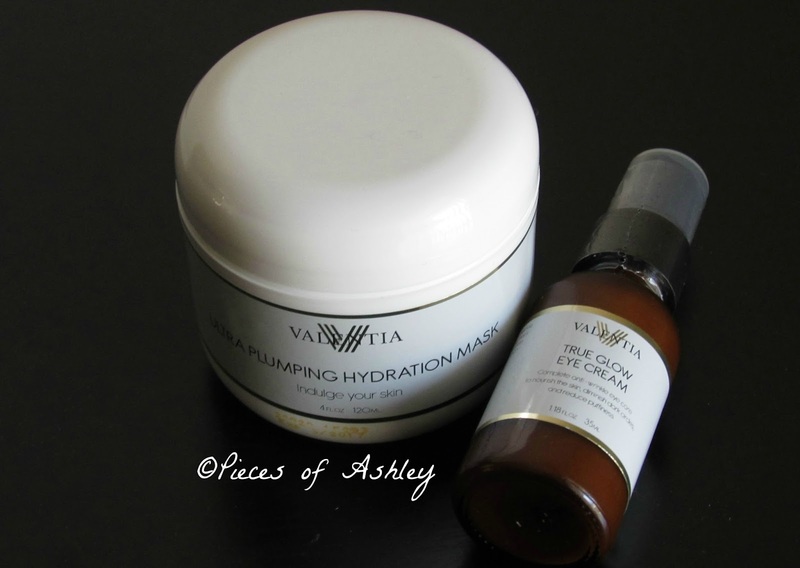 The Valentia Ultra Plumping Hydration Mask is no different, it might even be better. It looks creamy and thick, but when applied to the face its a different story. The texture is thin and quickly dissolves in the skin. I love how the mask is easy to apply. You don't have to put to much on (but make sure it's enough). A lot times products leave a greasy feeling; but with this I have no greasy feeling or residue left. My skin feels refreshed and very moisturized. It also feels very soft. My face looks moisturized and hydrated. I also see a nice glow, which I haven't experienced before. When applying this mask you need to leave it on between 15 to 30 minutes. So if you're in a rush you can leave it for 15, but if you have time I would go for the full 30! I have tried both times and either one is fine. But like I said if you have time, I prefer the full time. You will definitely see an even better difference. Overall these two products are worth trying! *Sponsored Post. I was sent these products for free in exchange for my honest review. All opinions are 100% honest. Btw, I love the new layout. Thank you :) I definitely recommend this. I also love how it uses natural ingredients!